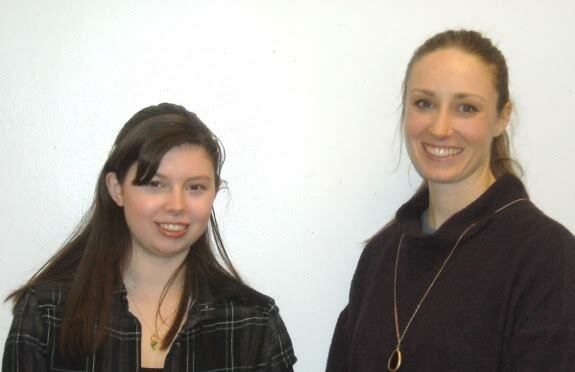 Pictured are student Grace Griffin and Film and Video Production Teacher Caitlyn VanderMass. Grace is a videographer who works the digital video camera, directs a crew and edits the videos for Nyack High School events. In high school, a videographer is responsible for recording live events and documentaries. The video advances the culture of the high school and can be placed on its website for greater viewing by the community. The videographer and crew have to set up the equipment and make the necessary adjustments to the lenses, microphones and lights to capture the footage successfully. 1 An important aspect of filming is using a variety of angles. Focus on the speaker and switch between several angles to give the video some liveliness. Some angles may cause shadows on the presenter’s face or body. 2 Mark your safe zones from which shooting will take place to avoid a member of the audience to bump into the camera. 3 Run some tests ahead of the event to determine which areas would be safe enough to film from. 4 If the event is a speech or panel discussion, have all of the participants in the frame. The most basic feature of a digital video camera is the viewfinder. It enables the user to look at the scene being filmed and move the camera accordingly. In a digital video camera, the viewfinder is an LCD screen. The size of the screen varies from model to model, but is mostly a small display just big enough to show vivid images of a scene. In smaller cameras, it forms part of the camera’s body at the back. In big cameras, it flips to the side, away from the camera’s frame when in use. The viewfinder can rotate to allow the person to film from various angles. An integrated microphone is located next to the lens to record those sounds from the scene the lens points to. The zoom feature enables distant scenes to be filmed with ease. Digital video cameras incorporate a stabilizer that reduces the ‘shake’ in the video images. Editing the footage gathered is also another responsibility of videographers. It’s done in the studio during the post-production of the event. They use editing software to cut out parts of the video that are not necessary to the finished product. They may also add graphics, text or other special effects to the footage. Videographers are also integral to the creative production process, as they may make suggestions on how a particular scene should be shot to highlight a subject’s features. They may also make suggestions as to what topics to cover or the personalities to interview for a documentary. It’s common to shoot far more footage that’s actually needed and only the best material is chosen in the final edit. Most videos serve a purpose, such as telling a story or providing information. Editing is an important step in making sure the video flows in a way that achieves its goal.